Oh I LOVE Fall!! You can usually find me at Ragamuffin Coffee Roasters but on Sundays, when they are closed, I can grab a random coffee at Starbucks. 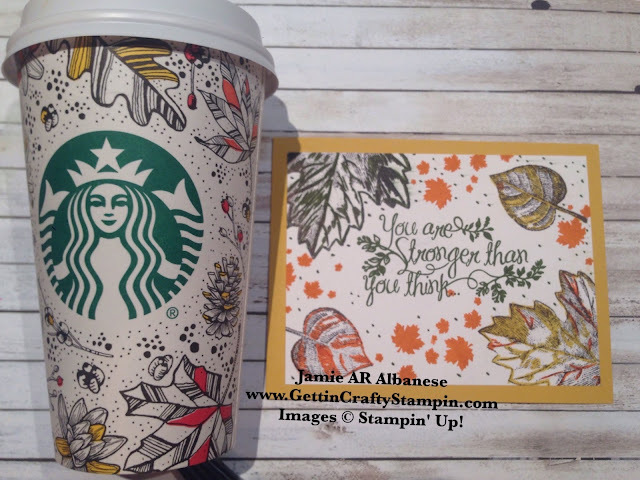 This fun coffee cup inspired a card from our recent Stamper's 10 Club (meeting this weekend - RSVP and try it out!!). A fun and funky Fall hand-stamped card perfect to deliver some warm smiles this Fall. During Fall, aka Pumpkin Season.. sigh.. momma needs her pumpkin and caffeine intake! Here is a fun and inspirational card that will deliver some cheer and hope. I started with stamping the sentiment from the Heartfelt Sympathy in Mossy Meadow ink on the center of the Whisper White card stock. 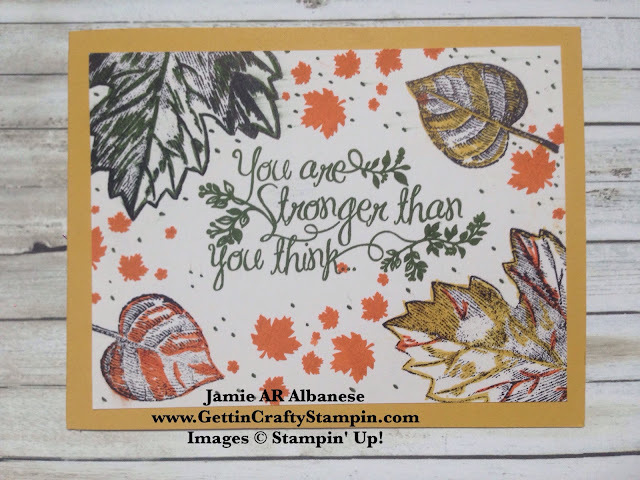 Stamping around the sentiment with the Black Archival ink pad around the center and Vintage Leaves collection. Finding inspiration in a warm cup of coffee can inspire me to send a hand-stamped card and maybe a gift card to bless them. What a great gift idea! This card is fun and eclectic with the pops of color at random. I love it!! Using the 2015-17 In Color Stampin' Write Markers pen side to draw in some pops of color along the black stamped leaves. The Mossy Meadow Stampin' Write Marker with dots across the card for a cohesive look. I love the Perpetual Calendar stamp set for a fun background image!! Here the Tangelo Twist In-Color ink pad adds to a cohesive and warm colored card. 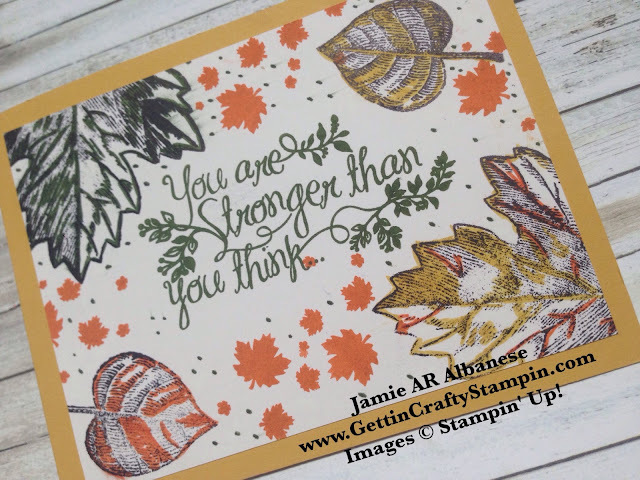 Layered over the Hello Honey card stock for a Fall card that will give support and hope. REMEMBER.. Photopolymer stamp sets are great but have a little extra care in using them. 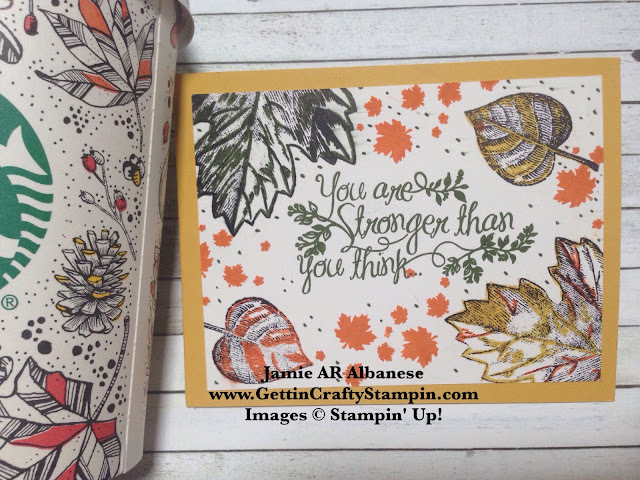 Create your best image when you stamp with a Stampin' Pierce Pad UNDER the card stock... see more on Photopolymer care and tricks when you click here!! What inspires YOU?? Beauty surrounds us in nature, fashion and even your favorite drink! Send hope, inspiration and care this Fall, all wrapped up in a hand-stamped card. I absolutely love this Heartfelt Sympathy stamp set is a MUST for all who want to send some love in the mail. A hand-stamped card is a small way to bless someone and show that you care. Join Us in creating and sending love at our card making classes (in-person or to-go).